The Paris-Dakar rally, created by Thierry Sabine, covered 10,000 km of African desert and attracted motorbikes, cars and trucks. 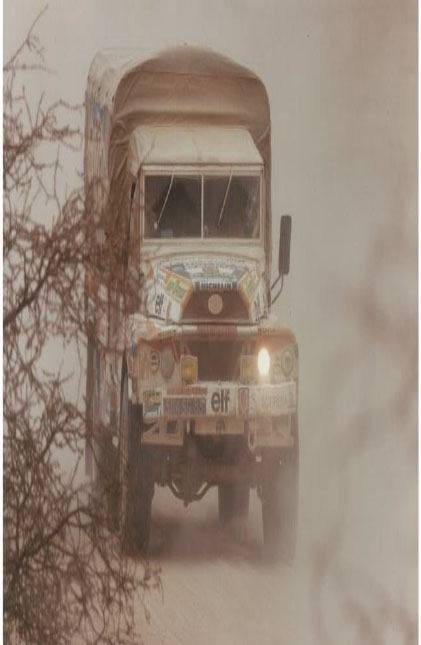 For the third rally in 1981, two Acmat VLRA 4x4 trucks left the starting block. On board, two army crews from French civil security units. 1. The winning VLRA truck in 1981. Useful load, 2.5 tonnes, maximum speed 90 kph, 6 cylinders, 22 litres/100 km, range of 1600 km. 200-litre drinking water tank. One of them was forced to pull out while the other, driven by Captain Villette, Adjutant Gabrelle and Adjutant Voillereau, won the race by a good margin although they were constantly stopping to help other competitors in difficulty. Out of the 250 vehicles that began the race, including 162 4-wheel drives, only 44 crossed the finishing line. The VLRAs performed remarkably well, with only one puncture and one radiator leak. For ACMAT, it was a convincing way to demonstrate the vehicle’s excellent resistance.